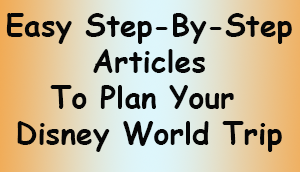 There are a lot of ways to get ripped off when it comes to Disney World ticket purchases. When you’re trying to save money, it’s best not to gamble, even if the discount is really temptingly large. Just imagine arriving at a Disney park, tickets in hand, and being turned away! Now you have to pay full price at the gate, or go home. Not fun! You can find these tickets being offered in various locations around Orlando, as well as on public auction sites like ebay.com, and used sales sites like Craigslist.com. There are three reasons why it’s a very bad idea to buy someone else’s partially used ticket. Any one of these reason one is good enough, so just know that if you do buy used tickets, you’re likely to lose your money. And don’t count on Disney to be sympathetic and flexible. We hear that they are very strict. First, resale of partially used multi-day tickets is illegal in Florida. Check out the Florida statutes here. Anyone doing this can not be trusted, and could be arrested for this. You’ll see ticket sellers in various locations all around the Orlando area. Danger Will Robinson! If you’re younger than me you may not get the reference to the old Lost in Space TV show, but you get the idea. Second, you can not transfer Disney Tickets. Disney will know. They see all! Disney World now uses a scanning device that takes your finger print whenever you enter a park, and it’s connected to your ticket. Your fingerprint is not going to match the fingerprint of the original ticket owner. You can’t fake that unless you’re James Bond – 007. You’ll be out all that money! Here’s Disney’s ticket transfer rule for details. Third, you can not tell by looking at a ticket if it has days left on it, or if it has No Expiration Date added to it. It could be completely used, and/or expired. The only way to tell for sure is to bring it to Disney and have them check it. There are more reasons I could add here, but why! I’m sure you already see that you’d be throwing your money out the window if you buy used tickets. 2. 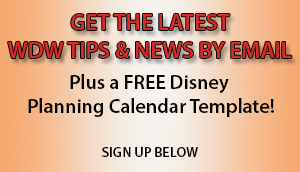 Avoid small Orlando area Disney ticket vendors – unless you’ve researched them specifically. There are a lot of scammers out there selling used tickets that won’t work for you. Though some of these businesses and people look official, there are too many scammers out there to take a chance. I’d suggest skipping it. There are many ways for these people to get what looks like legitimate ticket stock, without it being sanctioned by Disney. Even if they’re telling you that their tickets are valid, new and unused, there’s no way to know that they’re telling the truth until you get to Disney. 3. Avoid on-line non-Disney sources unless you’ve checked them out thoroughly. It won’t come as a surprise to you that there are plenty of scammers on-line. On sites like ebay.com and craigslist.com, you’ll find plenty of opportunities to buy, but there’s a good chance you’re buying a worthless tickets. Again, even if they look and sound official, don’t be sucked in. Then there are sites that look official, but keep in mind that it’s easy to build a website that looks good. It can be done overnight. And they’ll tend to give you a much bigger discount than some of the official discount sites and companies. I know it’s tempting, but again, research. If a company doesn’t have a really good on-line reputation with a lot of people on reputable websites recommending them, skip it. 4. Avoid Cast Member complimentary tickets if someone is trying to sell them. First these tickets can be faked easily, and fakes won’t work. Second they are not supposed to be sold. 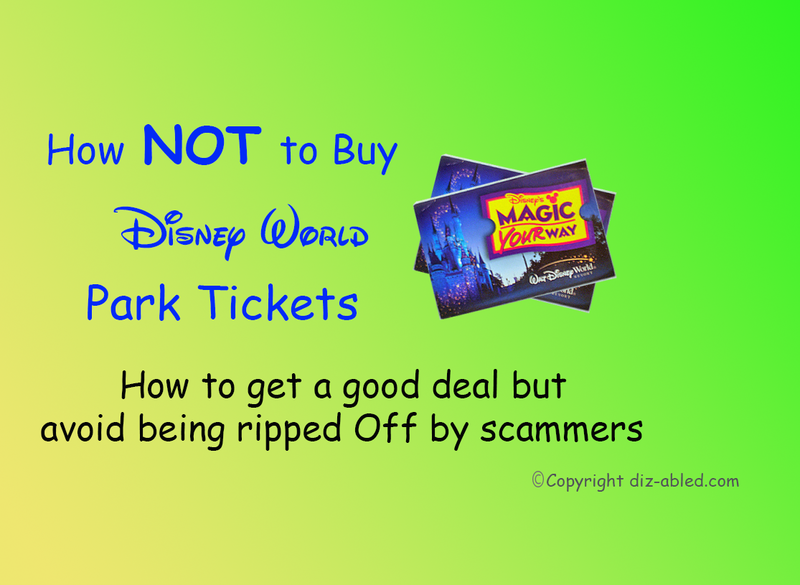 If someone is selling them, you can’t trust them to begin with, and it’s very possible that the tickets won’t work when you get to Disney.